Stainless steel can increase longevity and eliminate problems even in applications where cast iron pumps are commonly used. For example, Lyco Wausau pumps tolerate frequent acid clean-up and descaling, and they will not lock up from rust after sitting idle. Low service liquid requirements of 1.5-3 GPM (Water) are standard, and reductions of 50% and 100% are available with recirculation options. Conversely, Lyco Wausau offers an option for greatly increasing water flow for condensing applications. Medium Vacuum Models 101 & 501, with a completely open discharge port. Many pumps in the industry only offer variable discharge ports with holes and valves that can clog in especially dirty vacuum applications. 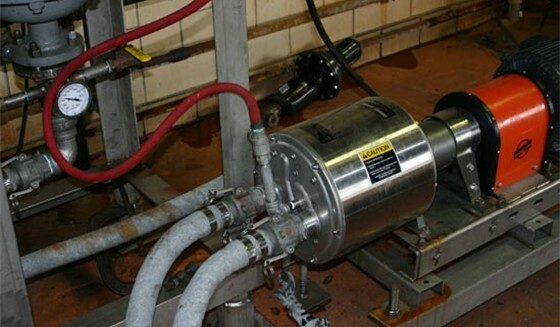 High Vacuum Models 102 & 502, with a Lyco Wausau variable discharge port that includes large holes and a flapper valve to minimize clogging problems. Lyco Wausau pumps feature a higher tolerance for drawing in solids because of a strategically located, 1⁄2" drain that can be used to flush out solids periodically or continuously. The smooth, polished stainless steel exterior design of Lyco Wausau pumps offer easier cleaning and attractive appearance. Trial pumps are available from Lyco Wausau. Try one at no risk.